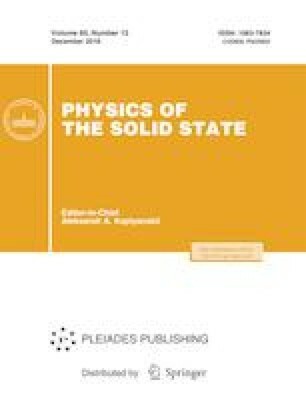 The Sr0.8Ce0.2Mn1 – yCoyO3 – δ (y = 0.2, 0.3, 0.4, 0.5, and 0.6) complex oxides with the perovskite structure obtained from simple oxides by the solid–state reaction technique have been examined using structural analysis and magnetic measurements. Substitution of Co for Mn in the dilute Sr0.8Ce0.2MnO3 antiferromagnet with a Néel temperature of TN = 210 K leads to a decrease in the degree of tetragonal distortion of the crystal structure and transition to the cubic cell. The degeneracy of the antiferromagnetic interaction (TN = 138 K at y = 0.2) observed at the first stage of the substitution of Co for Mn changes for its gradual enhancement with an increase in the magnetic transformation temperature up to 239 K at y = 0.6. An increase in the Co content weakens the competition between the ferromagnetic and antiferromagnetic couplings and reduces the temperature of the transition to the spin-glass-like state. The magnetic inhomogeneity and formation of Co2+–Mn4+ ferromagnetic clusters in Sr0.8Ce0.2Mn0.4Co0.6O2.69 at 140 K have been observed.